Declan Morris has been fascinated by big cats and their conservation since his first zoo visit as a child. 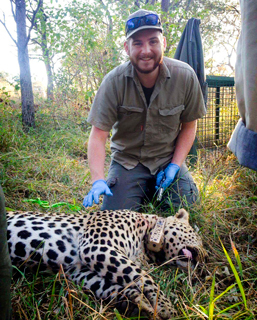 Now the University of Adelaide animal sciences graduate is living his dream in South Africa where he’s doing valuable research on the future of leopards. He is undertaking the first ever field study of the powerful carnivores in Loskop Dam Nature Reserve to help local management authorities better understand the size of the population and potential threats. The 25-year-old researcher is spending two years on the 22,000-hectare reserve, north-east of Pretoria, before heading back to the University next year to write up his PhD thesis. Leopards are classified as vulnerable by the International Union for Conservation of Nature so work aimed at protecting the species is critical. But Declan’s first challenge has been finding the animals. Leopards in the Loskop reserve aren’t used to humans and quickly disappear. “So far I’ve only seen a couple when we’ve been driving around the reserve but camera trapping has been working well for leopard identification,” he says. Part of Declan’s research also involves capturing the animals. This is important for collecting biological samples for genetics and diseases screening, and also for fitting them with GPS collars to track their movements. “There are a few options for catching them but we’re using cages because it’s the safest method for both humans and the animals,” he says. Declan is being assisted by the Mpumalanga Tourism and Parks Agency which is the provincial government authority in charge of nature reserves in the province. His work will help them better understand the genetic diversity of the leopards, threats from diseases such as rabies, their diet and the capacity of the reserve to support them. Tracking of the leopards is important because some wander onto farms and local properties where they face increased risks from human intervention. Another threat is the heavily polluted Loskop Dam and Olifants River which are contaminated by heavy metals and pesticides. “Most of the crocodiles on the reserve have already been killed – there are only six left – and we want to see if the pollution is affecting the health of the land animals on the reserve as well,” says Declan. Even though Declan still has two years to go before his PhD is finished, he’s already thinking about possible postdoctoral research. “One of the biggest threats to the leopard population is conflict with farmers and communities who poison, shoot and trap them, so I’d love to investigate conflict mitigation and ways to avoid the problems,” he says.